Lumabas na sa musiciansfriend.com ang prices ng mga bagong Tama products. Who wants P30,000 snare drums?!?!?!! mahal pala, hahaha, akala ko mura lang yan. pero meron silang warlord na $600 lang. lang sa inyo ang $600. But since we're talking about Tama snare drums, bro Gep may be referring to Tama's famous Bell Brass snare drums. IMO fernando pre. more bang for the buck talaga. bitin ang 18" lalo na kung rock ang tugtugan. rnb tugtugan eh..... sabagay more bang hehehe tnx mga bros..... e one more mga sir tubgkol naman sa quality..... mas ok parin ba yung fernando saka hindi naman kaya over priced? 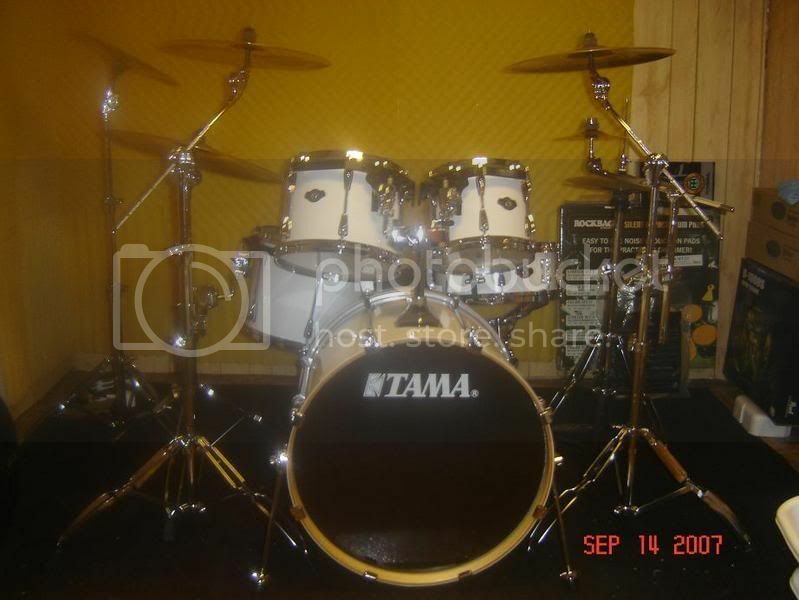 For TAMA Drums set owner..
pls post a picture of your own TAMA drums..
Eto ung picture ng drums ko.. Walk by \"Faith\" and not by \"Sight\".. Always keep the Faith..
Maganda kasi yung tunog at itsura nung mga Superstar Custom na nakadisplay sa mga Audiophile, kaya naintriga ako sa Tama... ngayon, nagpa-quote ako ng special order na Starclassic Performer. Mukhang depende sa presyo nun kung Starclassic ba o Superstar kukunin ko. Kaso basta Tama na 'to! You're right mga brod... Kung etong akin nga swingstar lang Actually this is the lowest bottomline ng TAMA and yet Astig padin tumunog?? i'm an owner of powerglide twin pedal and an ancient imperialstar snare..
Tell us something about your Superstar drums. Maybe you can share some reviews or feedbacks or comments or whatever experience you had with it, after owning it and playing it for quite some time. The Superstar kit is one of my prospect kits for Christmas. I've already tried and played on a Superstar kit a number of times, and I enjoyed it. But I hope to read feedbacks from actual Superstar owners. Thanks in advance! Wala akong Superstar Custom kaso sobrang nakilatis ko rin yung series na yan sa paghahanap ko ng bagong kit. Para sa presyo, solb na solb ka na sa Superstars. Ganda ng pagkagawa sa shells: bearing edges, finish, kahit yung kahoy na gamit (birch na may onting basswood) eh sobrang okay lahat. SOLID yung hardware: die cast hoops tapos naka-starcast pa. Yung mga issue ko lang sa Superstars eh di ko gusto ang mga available na finish (kahit maganda yung pagkagawa, ayaw ko lang talaga yung available options) tsaka ayaw ko itsura nung bridge lugs. In short, cosmetic lang ang mga shortcomings ng Superstar. Kaso kung sa tugtugan lang - maganda tunog, madali itono, durable yung hardware - wala ka nang hahanapin pa. Yes I agree na hindi ko rin nagagandahan ang available color options dito ng Superstar although gusto ko yung Mahogany Fade sa Audiophile. I bought a Vintage Blue kit and ended up rewrapping it. Compared to the cost of Superstar EFX, comparable yung price ng SK kit ko + new wraps. So it ended up like a customized Superstar EFX! Hindi ko rin gaano gusto yung 1-piece lug but considering the benefits of a 1pc high tension lug, mas less ang stress nito sa shell compared sa split lugs. 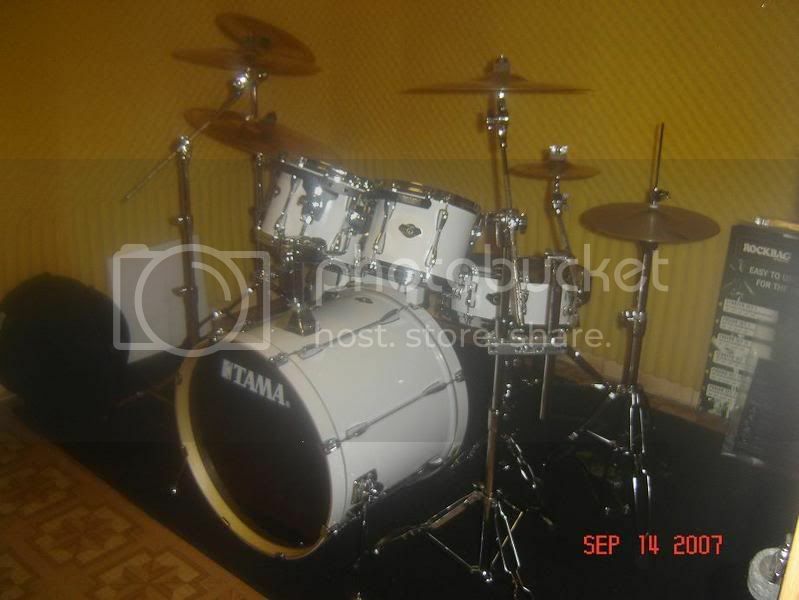 Other than that, everything in this kit is a winner; price, shells, hardware, sound, etc. everything you need in a high end kit is already here. Thanks for the feedbacks! Keep 'em coming. I recently wrote a blog entry regarding my thoughts about the Superstar drums. I want to share some excerpts (http://anthonydio.multiply.com/journal/item/110). "Right now, I'm feeling Tama drums. Tama is very much what's in my heart. I proudly own and play two Tama snare drums and a Tama Iron Cobra double bass pedal. It's also a brand of drums that I'm very familiar with and feel so at home with. Some of the best kits I ever played on are Tama kits, such as their Starclassic Bubinga kit (Here's my old blog entry about that kit - http://anthonydio.multiply.com/journal/item/75/Bubinga). The Superstar drums are one of the best mid-level models available right now. With its birch shells, die-cast hoops, Star-Cast tom mounting system, and strong, dependable and well-designed hardware (which is Tama's strongest reputation), these can pass as high-end models. I've tried and played on a Superstar kit a number of times, and it was always a pleasure. It felt wonderful and it always sounds great." Yun nga e... pinagiisipan ko pa kung worth it ba na halos doble ibayad ko para sa Starclassic Performer (kumpara sa Superstar) dahil lang sa itsura. Kaso ang ganda kasi ng Antique Sunburst e! Tsaka ang panget din kasi ng bridge lugs. Consolation ko siguro eh kung yung Starclassic kunin ko, panghabambuhay na yun. At dahil Tama yun, pwede naman iexpect na pwede ngang panghabambuhay yun. Add ko pa nga pala...For my Superstar kit, I really like the sound of my bass drum. It produces a deep and boomy tone yet still punchy, it really gets into your chest. Its a 20x18 kick with EMAD batter and stock front logo head. The toms are all fine, nothing of so much difference as my Pearl session. The Superstar bass drum is really a dramatic change from my Session kick. luma na un pero pag upo ko nabigla ako! Bad Behavior has blocked 46822 access attempts in the last 7 days.